“Yahweh and his Asherah” is written across the top of this eighth-century B.C. drawing on a ceramic pithos, or storage jar, from Kuntillet ‘Ajrud in the eastern Sinai. 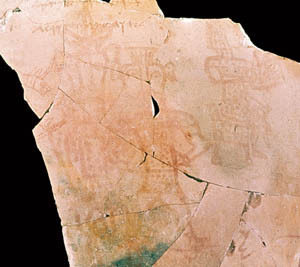 Some scholars have theorized that these figures resembling the Egyptian god Bes (on the left in the photo above) are in fact a drawing of God and his consort. Others, however, have interpreted both figures as male. The recently published Kuntillet ‘Ajrud excavation report sheds some light on this enigmatic fragment, but many questions remain. Photo courtesy Dr. Ze’ev Meshel and Avraham Hai/Tel Aviv University Institute of Archaeology. Why has it taken nearly four decades to publish this final report? One reason is that everything about Kuntillet ‘Ajrud and its finds is so darn difficult to interpret—or even to see. The recently published report is a superb volume, and the discussion and interpretation will surely continue far beyond its pages.